Arts Archives� mission to bring to wider notice the work of Peter Maag through the publication of tapes surviving in radio archives has hit the jackpot here. This is rather more than the umpteenth RAI broadcast of an opera given in concert form, useful as some of those recordings have been. Today, alas, Naples hits the front page news in Italy with depressing regularity as a result of the spiralling violence of its organized crime. Almost fifty years ago, when culture still meant something to those governing Italy, things were different. Naples may have been chaotic even then, but in 1958 the San Carlo Theatre and the RAI got together to create the �Autunno Musicale Napoletano� � all this is set down in Davide Annachini�s splendid note � as a sort of Neapolitan answer to Milan�s Piccola Scala and Florence�s Teatro alla Pergola. A series of baroque and early classical operas were to be presented in the Court Theatre of the Palazzo Reale. The enterprise opened on 27 September 1958 with a star-studded �Don Giovanni� � Petri, Bruscantini, Ligabue, Alva and Sciutti, conducted by Sanzogno and produced by a young man of whom great things were expected. His name was Franco Zeffirelli. The event was broadcast live on television. I wonder if it survives? The next season also opened with Mozart. This time it was �Figaro� and it marked the Italian debut of Peter Maag, much of whose subsequent career was to be built around that country. In later years Maag�s interpretations were dominated by a romantic warmth that seemed a throwback to earlier times. In the 1950s his Mozart was a fizzing harbinger of the historically informed performances of twenty years later. As we listen to the Overture we are struck by sizzling vitality of the strings� articulation, the rasping colour of the wind playing and the lean, detailed phrasing. We are also assured about certain other aspects of the production. The name of the �Orchestra Alessandro Scarlatti di Napoli� may strike terror among collectors of pirate opera recordings and indeed it could be a lackadaisical band at its worst. Formed originally for the rediscovery of the Italian baroque repertoire and for the propagation of small-band Haydn and Mozart it was a pioneering effort parallel to England�s London Mozart Players. It was, in fact, guest-conducted from time to time by the LMP�s Harry Blech. Unfortunately the parallel does not end there since both Harry Blech and the Scarlatti�s Franco Caracciolo lingered on far beyond their sell-by date. Caracciolo was still at the head of the band when it became the first of the RAI orchestras to be axed in the early 1990s. But guest conductors such as Celibidache could do wonders with it and so, apparently, could the young Peter Maag. Not only in the overture but throughout, string articulation is taut and many phrases are given a vividness and point we rarely hear. There are no long, all-purpose legato lines; instead there is that sharp definition of tight melodic cells which Harnoncourt and Co. thought they�d discovered much later. Even the acid tone of the principal oboe is turned to creative use. We can also rest easy about the recording. Stereo broadcasting reached Italy in 1961 but evidently experiments had been going on for some time since this is not only a stereo recording but an exceedingly vivid one, with separation even verging on the gimmicky. You can almost hear each single stringed instrument in the overture. And when the voices come in they are not in front of the orchestra, as often in those days, but in a natural position behind it, and can be heard moving across the stage, or further back. In short, you hear the opera as if you are sitting in the stalls, about five rows back from the orchestra. Maag ignores the applause at the end of the overture and swings straight in to a headily paced account of the first duet. I�ve already described his orchestral style. His pacing is equally upfront. In almost every case he shaves a few seconds off the famous 1955 version under Erich Kleiber. But it is not only a matter of being faster. In Figaro�s fourth Act aria �Aprite un po� gli occhi�, while Kleiber resolves the orchestral accompaniment with great elegance, Maag has the violins jabbing at the upward grace-notes so that we really feel Figaro�s boiling rage. This is often Figaro�s �other� aria, an also-ran beside the universally-known �Non pi� andrai�. Here it makes its point. Just sometimes Maag takes a tempo slightly slower than one would expect in the context. Cherubino�s �Non so pi� cosa son� is not a single burst of impetuosity but an extremely detailed exposition of adolescent emotional awakenings, while Susanna is allowed the space to characterize each phase of Cherubino�s disguise in �Venite, inginocchiatevi�. In the Act IV finale �Contessa perdono� is very slow indeed, arguably too slow for an andante. I imagine that Maag wishes to point out this moment as the moral climax of the opera, and it shows that, while his interpretation may often seem a blueprint for later �authentic-brigade� performances, his aim is not actually musicological but rather that of communicating the best possible, and theatrically effective, overview of the piece. I grew up with the Kleiber recording which I bought on LP while still a student. While never quite finding a version to surpass it I have increasingly been finding it dated. Long ago it seemed anti-romantic but much water has flowed under the bridge since then. It is interesting to find it was already flowing so swiftly in Maag�s 1959 interpretation. The cast is worthy of the occasion. English readers will be puzzled at Annachini�s description of this as an �entirely Italian� cast when two members obviously aren�t. This is the one slip in an otherwise excellent translation that usually manages not to read as a translation. What Annachini said was �un cast �all�italiana�� � �an �Italian-style� cast�. The German and French translators took this literally: �ein Casting �all�Italiana�� and �une distribution �� l�italienne��. What I suppose Annachini means is that even those members who are not Italian sing the language as to the manner born � he specifically praises Streich�s diction and Blankenburg�s sounds excellent to my ears. The recitatives are in fact handled with extreme naturalness by everybody, respecting speech rhythms and fully understanding when to dash off mouthfuls of words and when to hold things up for more emphasis. The recitatives have always been considered a plus-point of the Kleiber set, too, providing a theatricality which compensates for any minor flaws along the way. I can only say that this is more vivid still, perhaps because it is alive but above all because the �Italian-style� cast could confidently communicate the words knowing that the public would understand them. Also of note is the accompanying harpsichord. Back in the 1950s the harpsichordist often stuck to the bare chords in the score but here is the sort of imaginative, illustrative approach we have come to take for granted more recently. Here, too, the performance sides more with the modern versions than with its contemporaries. The least-known of the principal singers would appear to be Figaro himself. 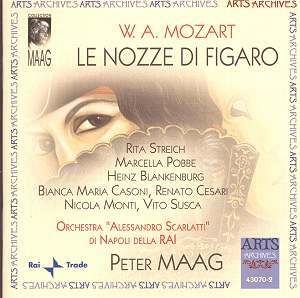 Of Heinz Blankenburg, Annachini can only tell us that his �activity in Italy seems to be a somewhat meteoric appearance that left very few traces after this Figaro�. Unsurprisingly, Blankenburg�s own website has more to say. In spite of his name he is American, was born in 1931 and had an international career lasting a good many years � including appearances at Glyndebourne � but was particularly associated with the Hamburg opera house. In later years he went into operatic production and is still active in the USA as a voice coach. Andrew Porter described him in the New Yorker as �someone whose performances are to be collected and prized�. Strange how some artists can have notable careers yet be ignored by the recording world. As far as mainstream recordings are concerned, I can only track down his Masetto in the Leinsdorf �Don Giovanni�, recorded in Vienna a few years after this Figaro. He also sang in the first recording of Penderecki�s �The Devils of Loudun� and a DVD seems to exist of a 1967 Hamburg �Figaro�, which may be sung in German. He reveals a well-placed, technically secure voice, fully in command of the role. He perhaps lacks the vocal personality of a Cesare Siepi or a Sesto Bruscantini, but his contribution is still an engaging one, well aligned to Maag�s conception. Rita Streich is, on the contrary, probably the best-known singer here, a favourite of both Furtw�ngler and Karajan. Her Susanna was already set down � and much-praised � in the first of the studio recordings under Karl B�hm. I haven�t heard this but I have heard others by the same conductor and have little doubt that I�d enjoy Streich�s extraordinarily vivid portrayal most under Maag. I wrote about Marcella Pobbe some time ago when Warner Fonit issued a portrait of her, including another performance of �Porgi amor� from the same year, this time under Bartoletti in Milan. I remarked that, in spite of the very poor sound she appeared to be an �exquisite Mozartian�. Pobbe is generally remembered as one of the generation of sopranos � including Carteri, Frazzoni, Cerquetti and Gavazzi � which struggled to find a niche for itself amid the Callas-Tebaldi rivalry but would be more than welcome today. There are occasional suggestions in the not-quite-clean style of this �Porgi amor� that she would have been more at home in Verdi, but I don�t wish to exaggerate and by the time she reaches �Dove sono� she has settled down to give a finely poised account. She has the �classy� sound we expect of a Countess. She is also quick on the uptake in her recitatives in a way her other recordings that I know had not led me to expect. The other singers probably circulated little outside Italy but appeared regularly in Cetra and RAI recordings. All give strong performances. Bianca Maria Casoni is fully alive to Cherubino�s adolescent awakenings � it�s a more vulnerable, less comic portrayal than usual. She is encouraged by Maag to give unusual and often original interpretations of her two arias � the exceptionally long caesuras at the end of �Non so pi� cosa son�, for example. Renato Cesari is a technically secure and suitably commanding Count � interestingly, many of the characters in this opera seem to play a dominating role in it while not actually having a lot to do. He makes the most of his opportunities in the aria. Nicola Monti made a number of distinguished appearances on disc, often with partners of the highest level: Nemorino in �L�elisir d�amore� in 1952 and a cast including Tito Gobbi, Almaviva in the first of Victoria de los Angeles�s recordings of �Il barbiere di Siviglia� (under Serafin), Beppe in the Callas �Pagliacci� and Elvino in �La Sonnambula� twice � first with Callas, then with Sutherland. He is a real stylist and makes a suitably odious Don Basilio. His aria, usually cut in those days, is included. Marcellina, on the other hand, loses her aria � the one cut of any moment in what is otherwise a pretty full text. This is inevitable given the decision to cast a fairly mature-sounding mezzo-soprano in the role. This is traditional but cannot be what Mozart intended since, when the aria arrives, it is the one technically-demanding coloratura aria in the whole opera, requiring a real soprano or at any rate a high, light mezzo-soprano. Fernanda Cadoni gives an excellent performance of the traditional kind but I presume the aria would have been beyond her. On the Kleiber recording the desperate remedy is taken of having the aria sung by Susanna but this is hardly a solution that could be attempted on stage. Let us be sanguine about the defects. I have praised the sound, given the date and the source, but it�s not state-of-the-art 2006 digital stereo. I have praised the orchestra, which goes far beyond its usual achievement, but it isn�t the Vienna Philharmonic � or the Orchestra of the Age of Enlightenment if your preferences lie in that direction. Applause breaks in after most of the arias, sometimes prolonged, during which the orchestra unceremoniously takes the opportunity for a spot of far from surreptitious tuning. There are a number of things that are done more noisily in Italy than anywhere else in the world and orchestral tuning is one of them, so be ye warned! Like any live performance, there are a few spills as well as thrills along the way. The prompter�s voice is heard pretty clearly at times. Maybe with repeated hearings I should find these factors increasingly impairing my enjoyment. Still under its spell as I write, I can only say that no other recording known to me brings to life the characters and events in the Count�s household as this one does. As well as the essay by Annachini, the booklet gives a synopsis in four languages and the complete libretto in Italian.